Palm Desert, CA (PRWEB) Lose the Belly Fat, a book about fat loss by nutritionist Marcy S. Gregory, takes a practical and remarkable approach to unexpected weight gain experienced by many women prior to and during menopause. At 45, Gregory was motivated to look into perimenopause and its side effects, specifically abdominal weight gain despite exercise and proper nutrition, and the accompanying frustration and even despair. A chance meeting with an older woman experiencing these symptoms inspired her to focus on premenopause during her graduate studies of human nutrition. Lose the Belly Fat is a pocketbook gem for not only perimenopausal women but also for “anyone, at any age, trying to learn how to eat correctly,” according to Jeralyn Brossfield, M.D., of Rancho Mirage Women’s Health Center. Gregory has kept this handbook brief and to the point for the purpose of accessibility and easy reference, offering a basic explanation of the reason for abdominal weight gain as well as suggestions readers will actually want to use for meals at home and when eating out. From preventative tips to effective weight loss and maintenance for those experiencing upsetting weight gain, Lose the Belly Fat offers relief for women who are already overwhelmed with a host of symptoms associated with menopause, making the overall experience more manageable. For more information or to request a free review copy, members of the press can contact the author at MarcysanMS@aol.com. 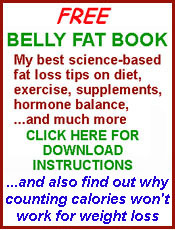 Lose the Belly Fat is available for sale online at Amazon.com, BookSurge.com, and through additional wholesale and retail channels worldwide. With an M.S. in human nutrition from the University of New Haven, Marcy S. Gregory has been a nutritionist in private practice since 2000. She specializes in teaching women to skillfully handle weight gain associated with menopause and age, having implemented her own recommendations successfully. She lives in California with her husband of 30 years.